I know it’s been awhile, but I just read the most beautiful poem by Ella Wheeler Wilcox, and I wanted to share. This breathtaking piece follows the soothing melody of a nursery rhyme, but has a great and terrible beauty to it. Perhaps it may appear a bit gloomy for a Friday afternoon, but Wilcox’s truth and personal pain rings through so beautifully in it. Enjoy! So about a month and a half ago, I came to the decision to stop blogging because juggling weekly blog posts with college, friends, and family became more of a challenge than a source of pleasure. Luckily for me, prior to making this decision I had signed up for the Great Food Blogger Cookie Swap, and the amazing outpour of passion and thoughtfulness of this event has reinstilled my desire to keep writing, cooking, and photographing for ModernAlice. Thank you to the wonderful ladies whose love of baking and blogging has been such an inspiration to me. The elegant packaging and sweet notes were just as motivating as the delectable cookies that I received and that’s really saying something! Lauren of SizzleEats sent delicious Whole Wheat Chocolate Chip Cranberry Cookies that reminded me that food blogging and fitness can go hand in hand. Healthy goodies that are not only delicious but good for you can be refreshing and exciting in a blogosphere so packed with sinful indulgences. Hannah of FleurDelicious made my mouth water with her Pistachio-Cranberry Mexican Wedding Cakes. Until now, I thought a good cookie had to include chocolate, but these buttery, melt-in-your mouth cookies were so delicious that I couldn’t put them down. Thank you for introducing me to such a delicious new cookie to add to my to-make list. Rachel Sally of Le Peche Fraiche made some of the prettiest cookies that I have EVER seen! My boyfriend swore that she must have bought them because her beautifully iced butter cookies were so professional looking. If you’re reading this Rachel, you truly should sell these wondrous holiday goodies! For my cookies, I wanted to share one of my favorite indulgences that somehow hasn’t made its way onto my blog until now: Epicurious’s Chocolate Toffee Cookies. These fudgey, chocolatey cookies taste almost brownie-like, but the toffee chunks provide a nice crunchy contrast. 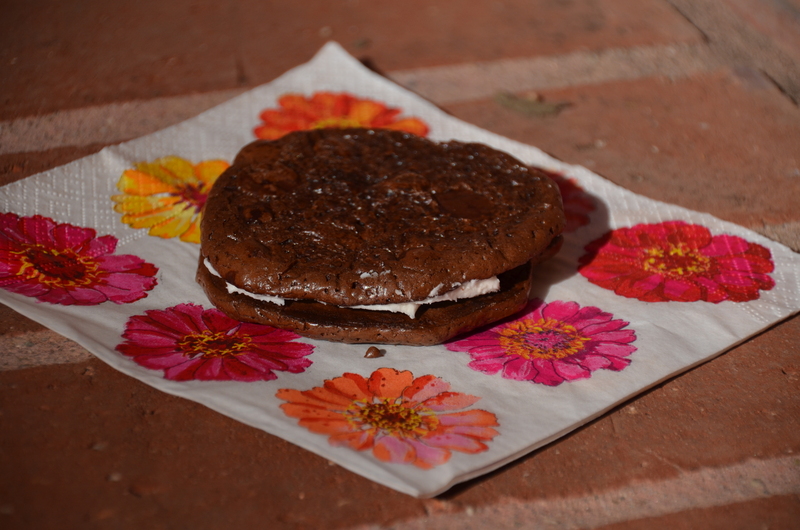 The recipe claims to make 18 giant cookies, but I made about 40 normal sized ones to keep the chocolate from becoming too overwhelming, but if you’re feeling adventurous, feel free to make 1/4 cup cookies, as originally recommended. Stir chocolate and butter in top of double boiler set over simmering water until melted and smooth. Remove from over water. Cool mixture to lukewarm. Using electric mixer, beat sugar and eggs in bowl until thick, about 5 minutes. Beat in chocolate mixture and vanilla. Stir in flour mixture, then toffee. Preheat oven to 350°F. Line 2 large baking sheets with parchment paper. Drop batter by rounded tablespoonfuls onto sheets, spacing 2 1/2 inches apart. You may have to return it to the refrigerator midway through the scooping process to let the cookie dough firm up again. Bake just until tops are dry and cracked but cookies are still soft to touch, 10-12 minutes. Top with sea salt if desired. Allow to cool on racks. For most people, Halloween is synonymous with sugary indulgence. From handfuls of candy to haunted cakes, most people completely abandon their ideas about healthy eating. The very mention of vegetables on this sinfully sweet holiday is almost unheard of. Spooky sweets shouldn’t get to have all the fun. With a plethora of shapes, textures, and colors, vegetables have wonderful potential to get a Halloween make over as well. This dish will make a wonderfully unexpected addition to any Halloween party spread. Plus the savory vegetables will help balance whatever sweets you are sure to consume as the evening progresses. These eggplants have garlic to ward off any vampires (if that isn’t your intent for the evening, be sure to grab a stick of gum or some handful junior mints) while the onions make surprisingly convincing guts and the tomatoes give the appearance of blood. This is a traditional Turkish dish that is perfect for any occasion, spooky intentions aside. It is perfectly salty and spicy and fresh all at once. Add some beans or beef crumbles into the filling and you have a complete meal. I used fresh basil, thyme, and oregano in this dish because here in sunny California, my herb plants are still thriving, but feel free to substitute dried herbs or use different herbs altogether depending on what you have access to. Peel the eggplants in stripes, leaving about half of the purple skin on the eggplant. Generously salt the exterior of the eggplant to make it less bitter, and set aside for 45 min (don’t worry, you’ll wash it off later). Heat 3 tablespoons of olive oil on medium-high heat in a deep sauté pan. Add onions, garlic, and peppers. Stir frequently to prevent browning. 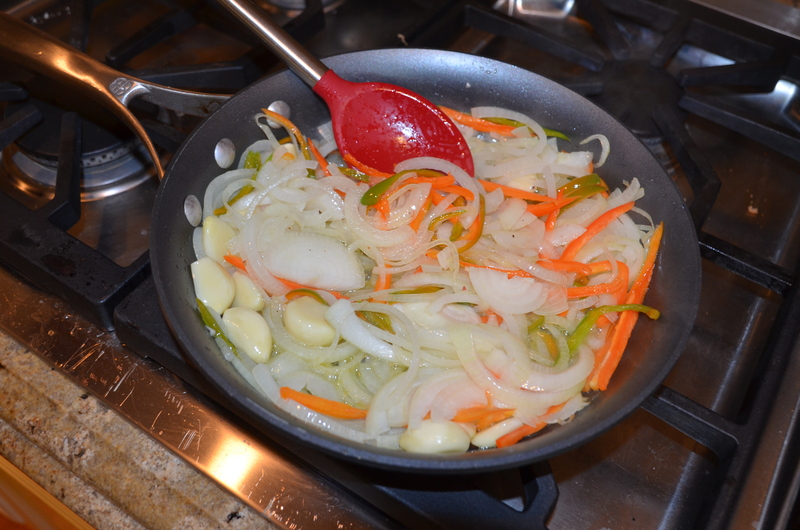 Continue to sauté the vegetables until the onions become transparent. Stir frequently to prevent browning of onions and garlic. 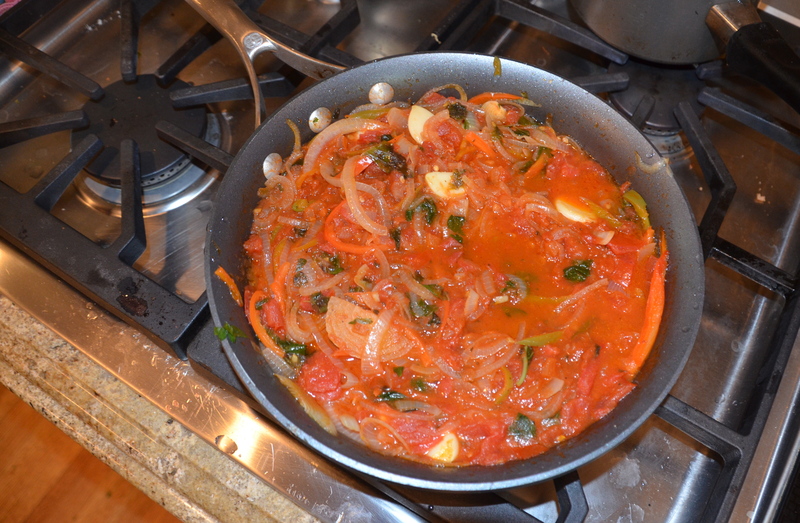 After onions are cooked, add the finely diced tomatoes, basil, oregano, thyme, salt, and pepper into the sauté pan. Cook for another 5 minutes. Remove the vegetable mixture from heat and allow it to cool. Wash the eggplants, dry. 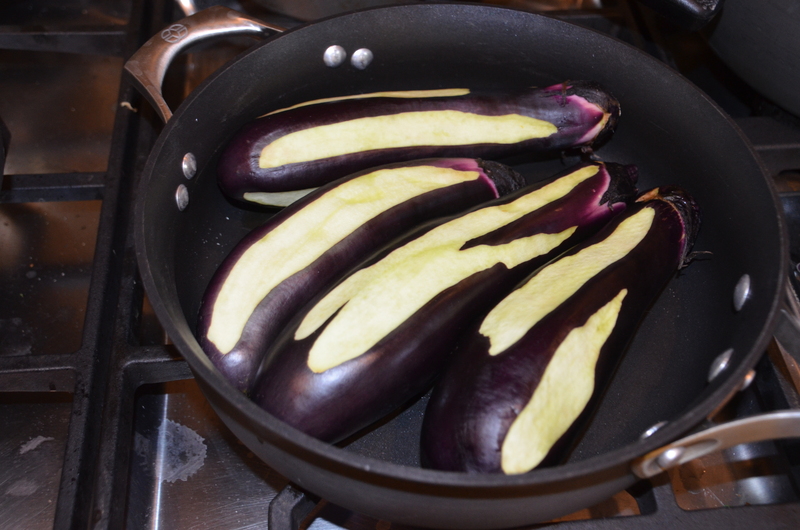 Heat the remaining 2-3 tablespoons of olive oil in a pan (preferably nonstick, if not you may need to add more oil), and lightly brown the eggplants on each side for 1-2 minutes. 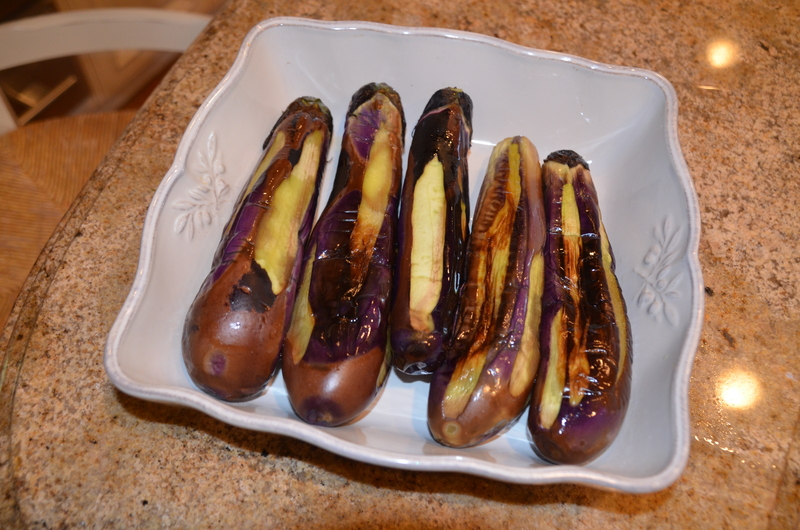 Set the eggplants in a baking dish to cool. Cut an opening slit through the middle of each eggplant, being careful not to cut all the way through the eggplant. Use your fingers to expand the opening slightly, so that there is a little pocket in the middle of the eggplant. Stuff the pockets of the eggplants with the tomato-onion filling, equally divide the filling among the five eggplants. Season with a little more salt and pepper to taste. Top the eggplants with the grated tomato into the baking pan,if desired. Cover the pan with aluminum foil, then make several slits on the foil to let the steam escape while baking. 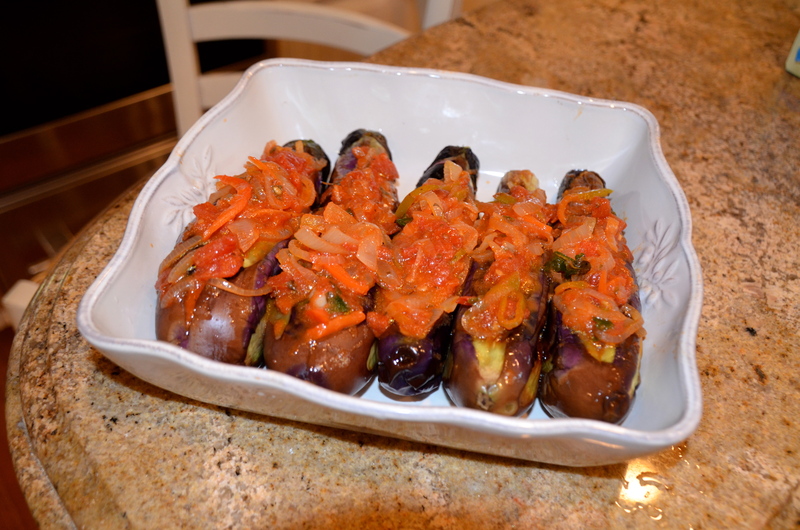 Bake the eggplants for 45 minutes or until the eggplants are soft and fully cooked. Fell free to dress up your eggplants with any spooky props from the party store. Fake bugs could be a fun added touch! Ever since I was little, Halloween has been one of my favorite holidays because I viewed it as the wonderful day of the year when you get to dress up and get free candy. Over the years, however, I have come to love Halloween in large part because it marks the beginning of the holiday season. Halloween is the first of many festive celebrations with exciting traditions,delicious food, and spirited decor. So here is the first of many holiday round ups to come in the next few months. Pumpkin Cat…too cute not to include, but please do not try this at home! 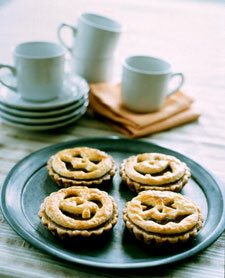 These Jack-O-Lantern tarts have a sweet filling, but with a spanikopita-style spinach filling they’d be absolutely divine! Mini Mummy Pizzas….so much cuter than the giant ones from the pizza parlor! In my family, what began as a simple pizza dinner with friends before trick-or-treating has evolved into a fanciful feast with creative, themed treats and appetizers. It’s a wonderful time to chat with friends and family in a more relaxed setting before the candy-crazed kids begin their neighborhood roam. What are your Halloween traditions? The blogosphere is abuzz with recipes for Halloween parties and Fall goodies, because these big seasonal affairs are universally exciting. But for now at least, I would rather celebrate the small things. The things that belong to no one else but me (and Goose too). It’s so easy to get wrapped up in the massive commercial holidays, even when you hardly know their significance, or even if they have one. Celebrating the little things, like straight A report cards, loosing teeth, the first snow of the season, and monthly anniversaries can bring just as much, if not more happiness. Just because the rest of the world doesn’t recognize how incredible it is to dating the same person for 39 months, doesn’t mean that it isn’t incredible.I have a habit of baking something for Goose for each of our monthiversaries, not because there is any societal custom that dictates that I should, but because I feel so incredibly lucky to shared another month with my best friend and favorite person by my side. I challenge you, find something for you to celebrate with loved ones this month besides Halloween. 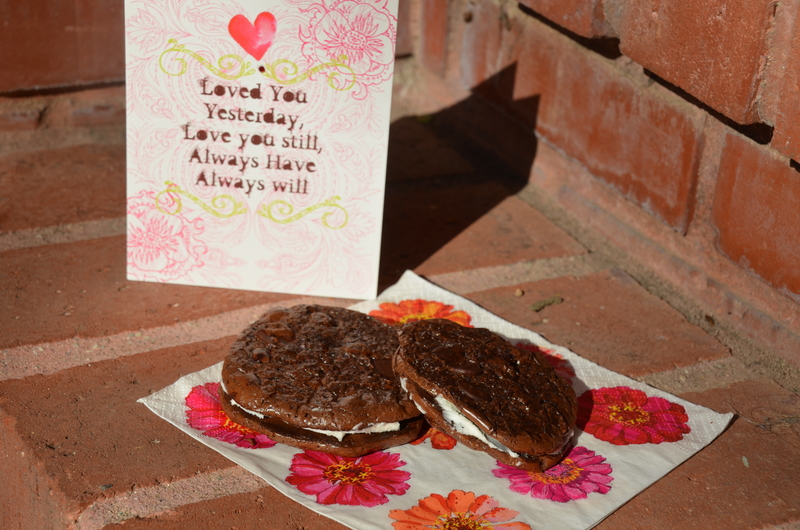 Maybe you’ll end up with a new tradition, or simply a way to jazz up an otherwise ordinary day. 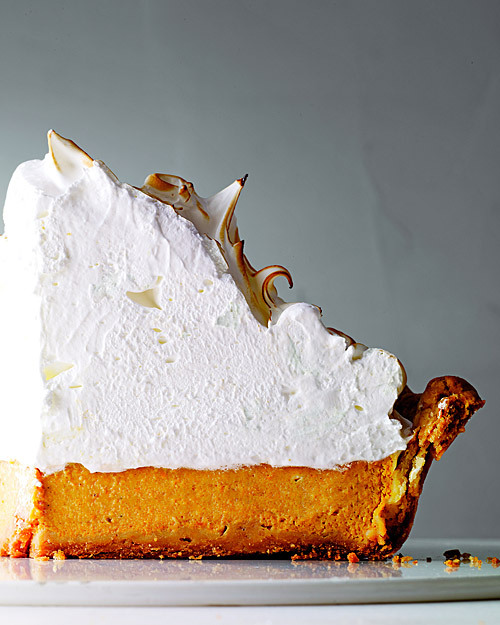 Today I’m not sharing jazzed up pumpkin pie or homemade candies, instead I am focusing on something classic and timeless, with a slightly modern update because that’s what life calls for. Something (or someone) who is dependable, but also adaptable. 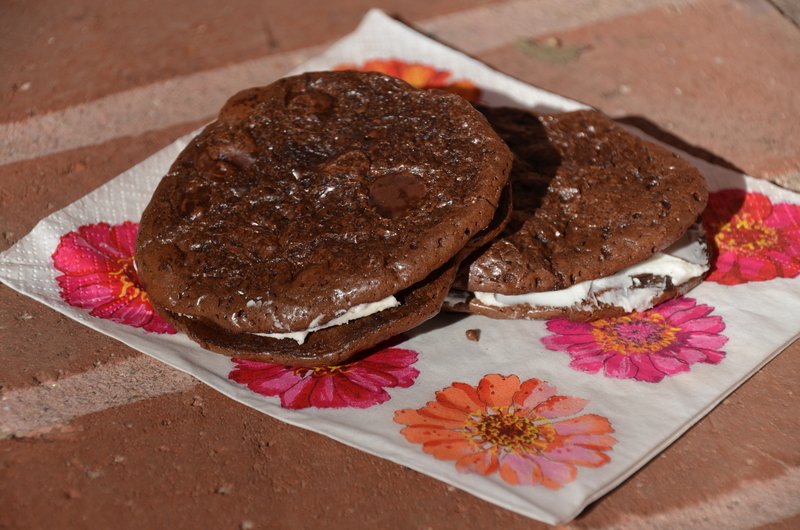 I present to you my Ooey Gooey Oreo Brownie Sandwiches. 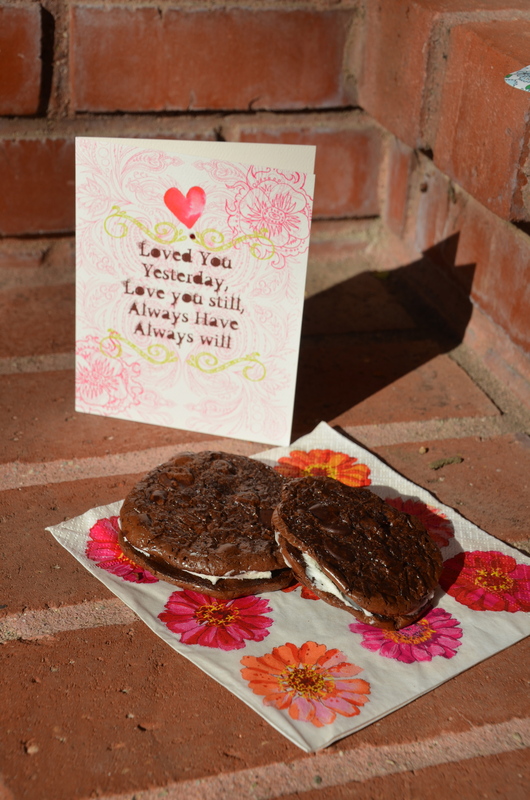 The cookies are almost like the lovechild between a brownie and a macaroon shell. They are perfectly rich and chocolately to satisfy any intense cocoa craving. 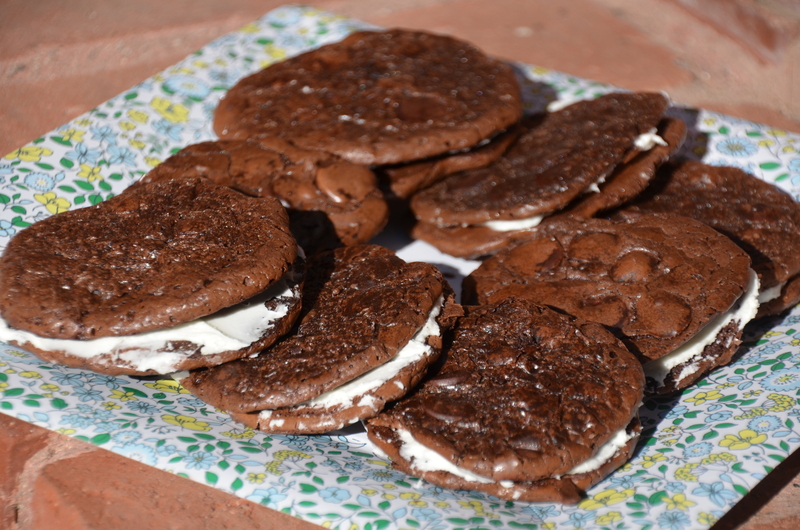 I prefer to devour the cookies plain, but for anyone who prefers sweeter desserts, whip up the oreo cream filling to balance out the intense chocolate flavor. As with your holidays, feel free to make these cookies entirely your own. Skip the filling and instead add white chocolate chips into the cookie batter, mix some salted caramel sauce into your filling, add a smear of peanut butter along with your filling to the sandwich. Try out anything that sounds good to you! Remember that this is your life, and you deserve to do whatever makes you happy. Preheat oven to 350 degrees F. Line two rimmed baking sheets with parchment paper and lightly spray it with nonstick spray. In a large bowl, whisk together powdered sugar with cocoa powder, salt, and espresso powder. Whisk in two egg whites and vanilla extract and beat just until the batter is moistened. You’re looking for a brownie-like, thick and fudgy batter consistency. If it seems too thick, add another egg white. Gently stir in chocolate chips. Spoon batter onto the prepared baking sheets in 12 evenly spaced mounds per cookie sheet. Bake for 14 minutes, until the tops are glossy and lightly cracked. Slide the parchment paper (with the cookies) onto wire racks. Let cookies cool completely. Because of the lack of flour, these cookies are very difficult to remove. You will loose some along the way, but don’t worry, the ones that refuse to make nice with you spatula are the gooiest, most delicious ones that should be going straight into your mouth! While the cookies are cooking, make the filling by creaming the butter in the bowl of a mixmaster, about 3 minutes, then slowly add in the powdered sugar and mix until incorporated. Add the vanilla and the salt, mixing for another 30 seconds. Match up your cookies into similarly-shaped pairs. 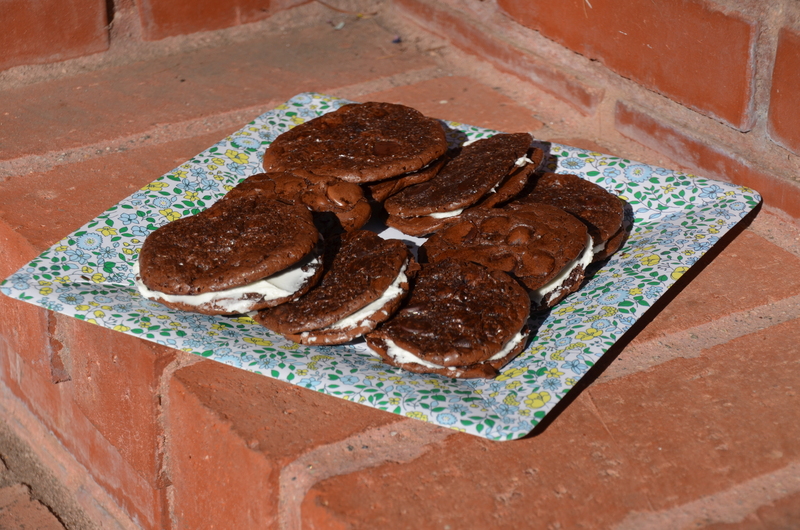 Spread the filling on one of the oreos, then smoosh the two halves together. Just as Prague seemed to be a city living in a fairytale world, Berlin seemed to be living in the horrors of the past 80 years. I was amazed by how openly the city shared its dark past, Holocaust, Cold War, and all. 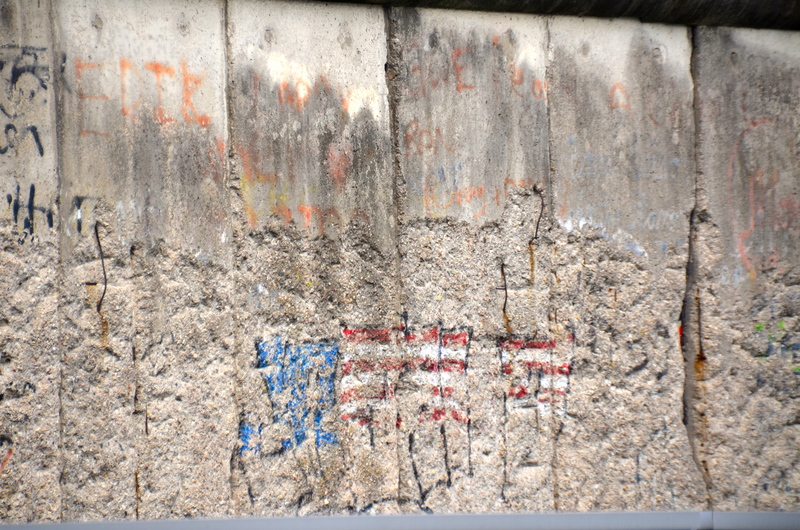 Here’s a portion of the wall that lies near Brandenburg Gate, open for all to see. 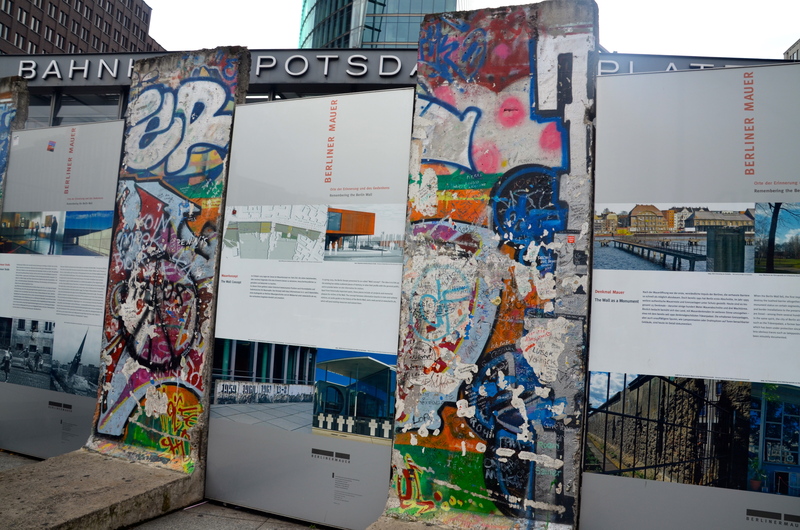 Near Checkpoint Charlie lies this extensive Berlin Wall memorial that explains the history of the Holocaust in Berlin from Hitler’s start in politics to the Soviet occupation of East Berlin. It’s incredible how much Berlin emphasized openness about its horrific past instead of trying to simply ignore it. As an America, I was proud to see that even in the difficult times of the Soviet occupation that America was able to provide the trapped East Berliners with hope. 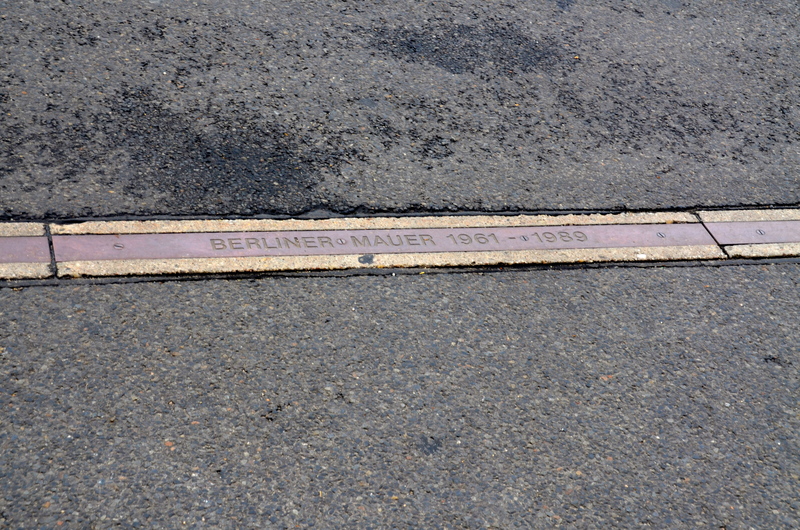 This marker of where the Berlin Wall used to exist marks the city streets as a reminder to people of how lucky they are to be free. As a tourist, it was amazing to be able to really see how artificially isolated East Berlin used to be within the city as a whole. 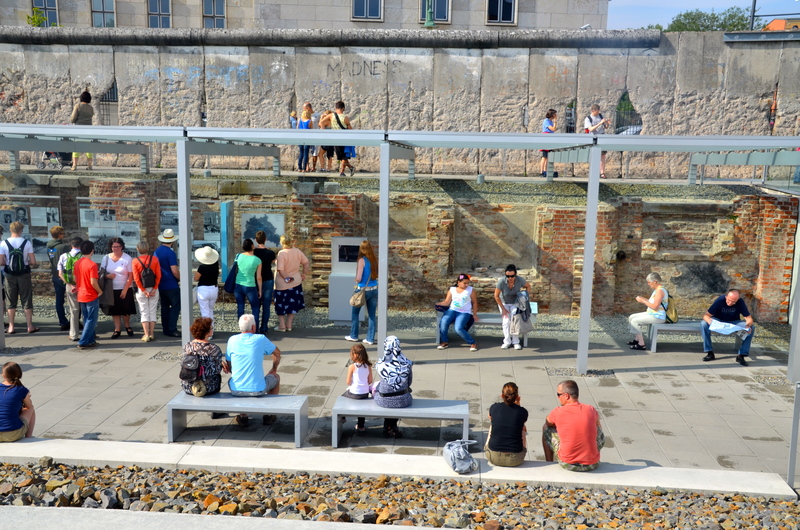 By incorporating history throughout the city to teach visitors, Germany plays an important role in keeping atrocities like the Holocaust from happening again.At the heart of the city stands The Memorial to the Murdered Jews of Europe, a looming, omnipresent reminder of the atrocities that the German government enabled. 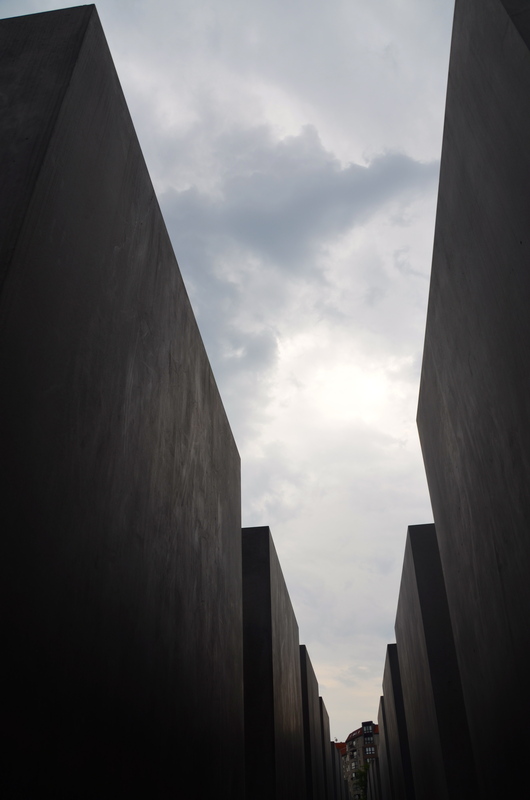 The memorial consists of 2,700 concrete slabs in varying heights, enabling visitors to walk through the memorial and feel the weight of being surrounded by darkness. 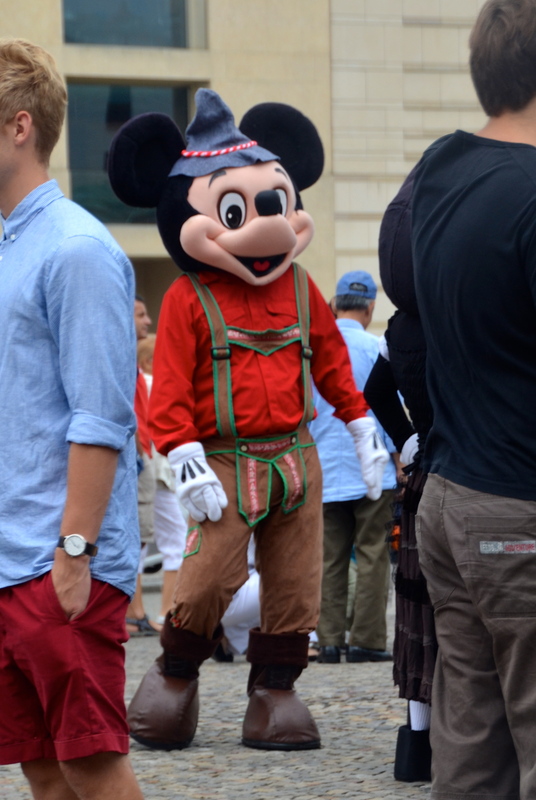 Just past the Brandenburg Gate lies the commercial district with many museums, shops, cafes, and this very impressive faux Mickey Mouse entertained tourists on a lighter note. 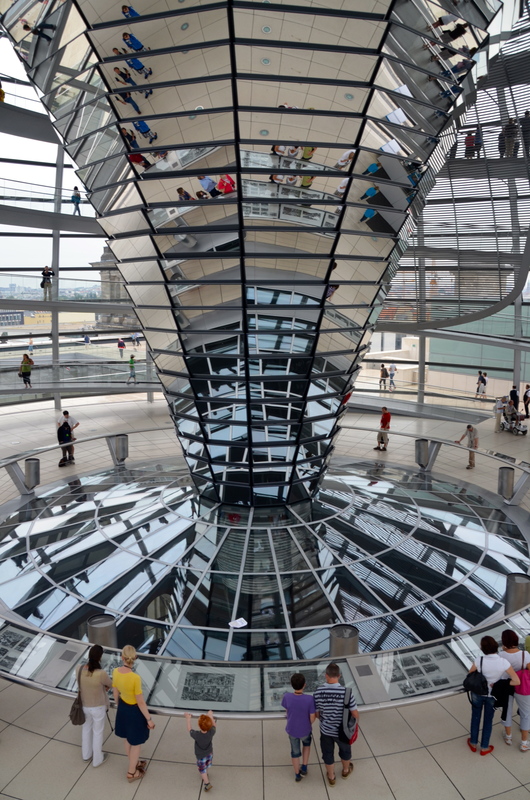 One of the most exciting thing we did in Berlin was to visit the Reichstag Building where we were able to go inside and walk around the walls of Norman Foster’s breathtaking glass dome. Berlin’s hot new landmark represents the openness of the government with the glass dome, visiting availability, and the view from the inside of the dome into the debate chamber of the German Parliament.bThe central mirrored cone (seen here) filters in sunlight and collects rain water. Make sure to register to tour the building in advance because visiting is free, but reservations are required. Giant pretzels seemed to be everywhere in Vienna, but they were even more abundant in Berlin, go figure. 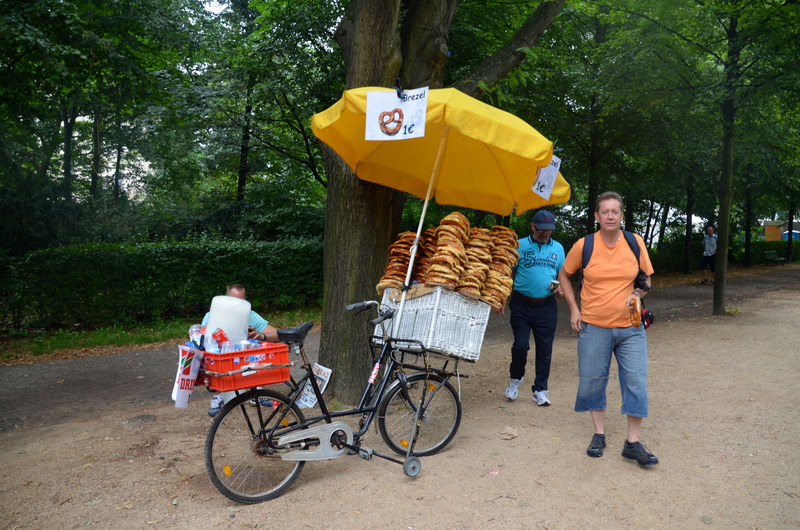 I love this bicycle vendor selling cheesey and regular pretzels in the middle of one of the parks. I’m not even a big pretzel person, but those cheesey ones were delicious! 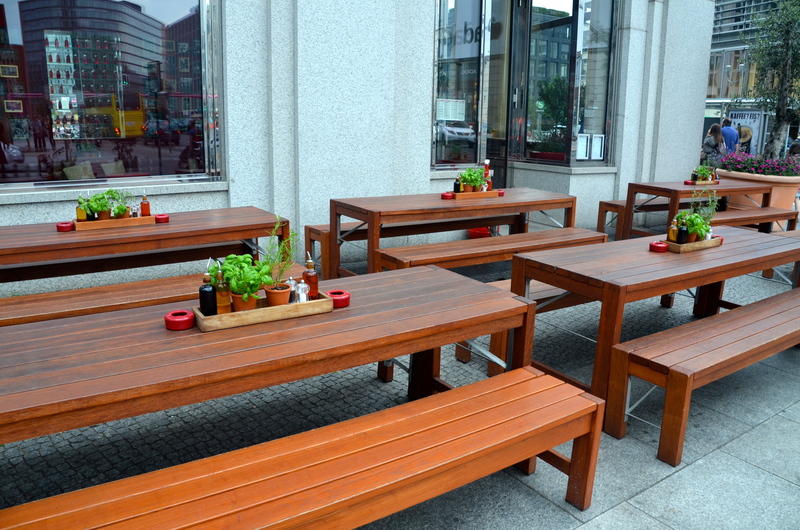 Mitte, Berlin’s equivalent of Soho, was full of tiny cafes and trendy stores. This is the perfect escape from the city’s more commercial areas. The shops were full of unexpected vintage goodies and unique items that are perfect to bring home as nontraditional souvenirs. Tukadu is an awesome little store where customers can pick their own kitschy beads and pendants to create custom jewelry. 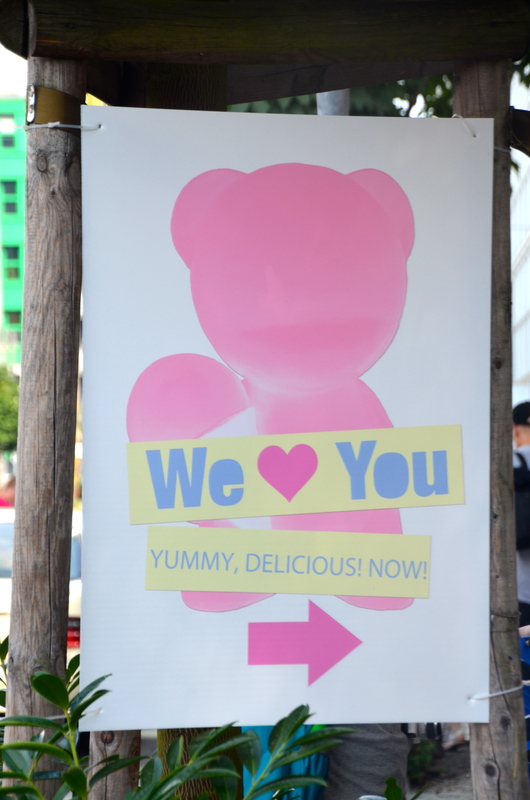 I love the adorable signage for this frozen yogurt place (or maybe it was a cafe come to think of it). The baby pink, bubbly letters, and sweet bear logo all make this a wonderful juxtaposition to the often gloomy atmosphere of the city. 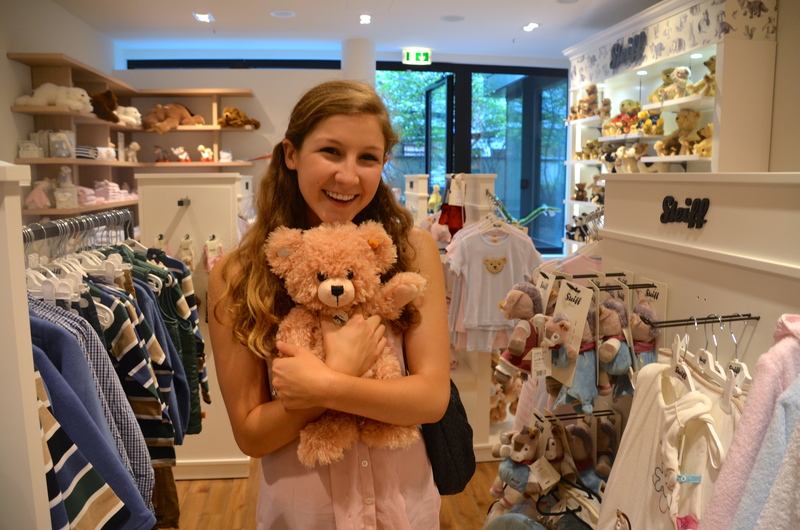 Speaking of bears, I absolutely fell in love with this cuddly rose-colored teddy bear at the Steiff Store. As far as designer toys go, no one does it better than Steiff. I was bummed that there was no toy factory to visit in Berlin, but this store was a great way to embrace my inner child. 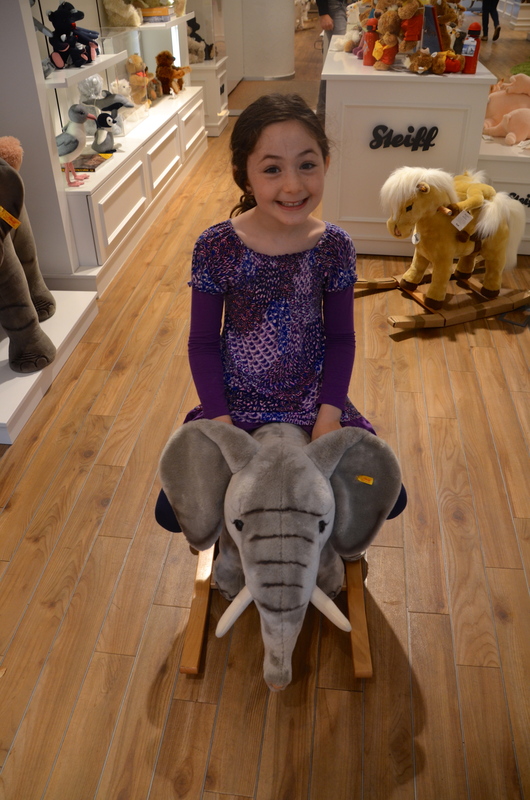 Here’s my sweet little sister Emmy playing with another one of the amazing animals at the Steiff Store. Something about being surrounded by hundreds of stuffed animals seems to being out the best in everyone. Check out this sweet pastel cafe setting. 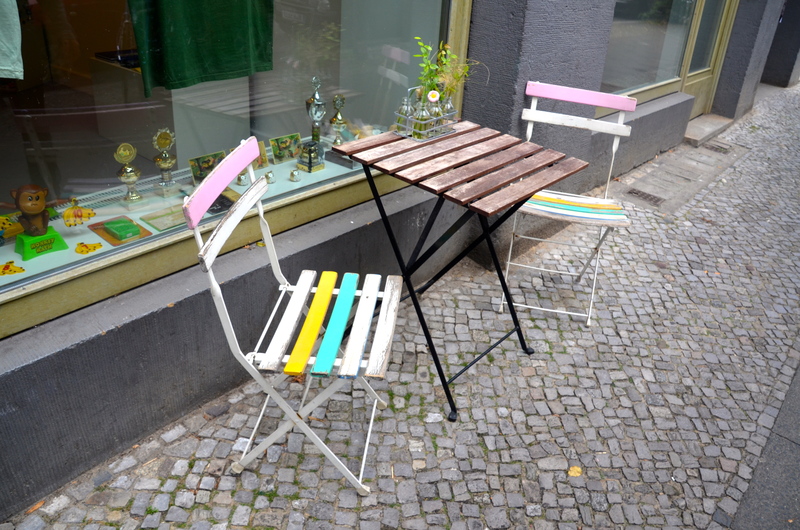 The colorful chairs and dainty daisies are a lovely light-hearted escape from the heaviness of the city. I love this clever idea of placing potted plants on tables in place of flowers both to serve as decoration and as self-applied garnishes to any meal. I definitely want to start setting my table with useful herbs whenever we entertain instead of wasting money on flowers that will have to be thrown out in only a few days! With the arrival of October, Fall is really here. ALthough the blogosphere seems to be flooded with pumpkin and squash, I still want to hold onto my favorite orange produce for a little while longer. I am relishing in the late-season varieties of peaches for as long as I possibly can. Nothing makes me relive wonderful summer memories like the sweet, juicy flavor of ripe peaches. Even as the temperature starts to cool down, I am determined to keep relishing in this simple pleasure. That’s how these muffins came about. 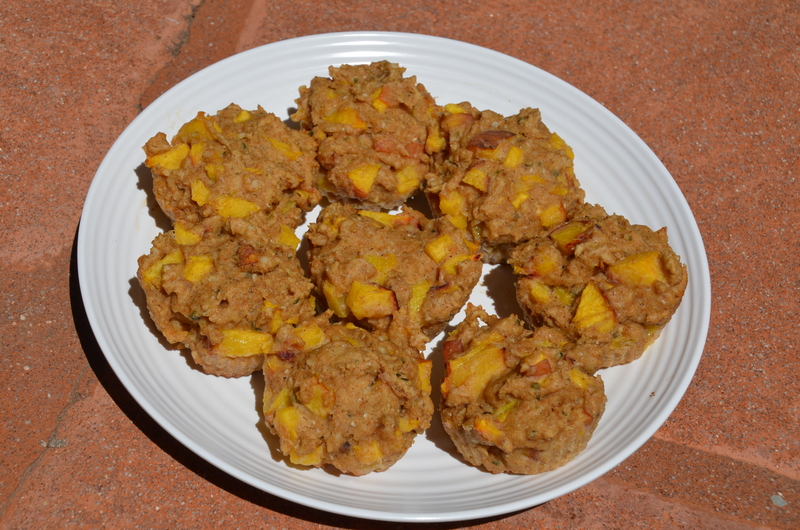 Packed with quinoa, chia seeds, flax seeds, coconut oil, and giant hunks of peach, these muffins are as good for you as they are tasty. No, they aren’t light and fluffy, instead they are packed full of nutrients. When microwaved for 30 seconds and served with a warm cup of tea or coffee, they make the perfect easy breakfast or afternoon snack. 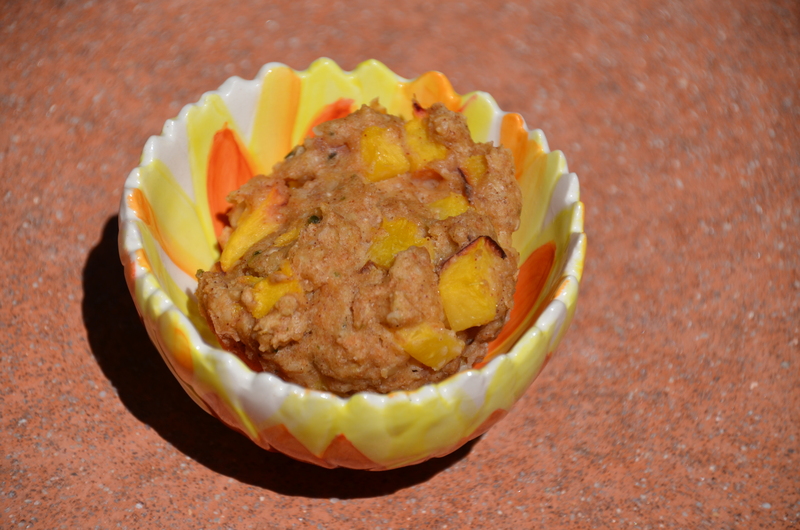 Go ahead and make a second batch and stash them in the freezer so that you can continue to enjoy delicious summer produce even in the monotonous months when apples and oranges are the only fresh fruits to be found. 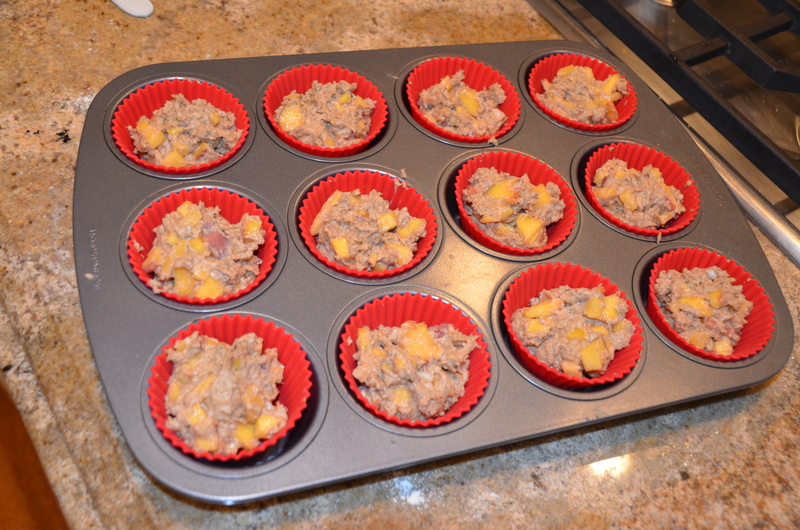 Preheat the oven to 350 degrees and line a muffin pan with silicone liners. Whisk together chia seeds and warm water in a small bowl and set aside. In a large bowl, sift together flours, baking powder, cinnamon, salt. Mix in the hemp seeds, then set aside. To the chia seed mixture, add milk, brown sugar, coconut oil, and extracts and combine well. 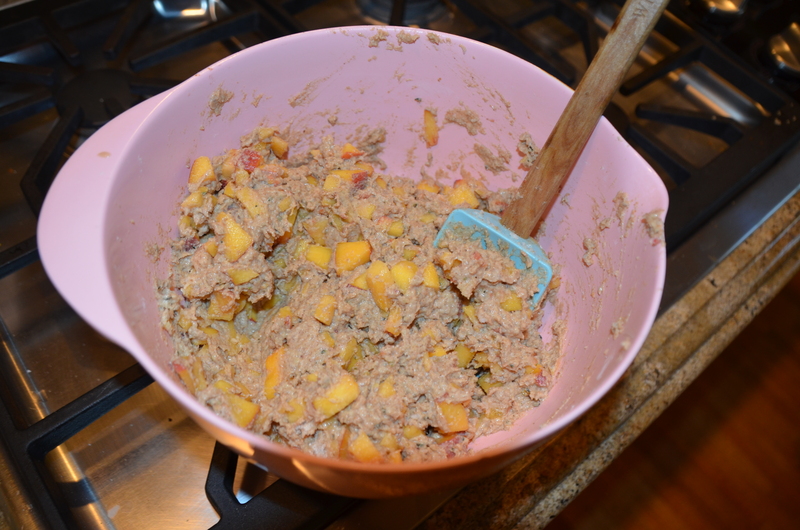 Add this wet mixture to the dry ingredients and stir gently to combine-don’t overmix. Gently fold in the peaches. Spoon batter into muffin pan and smooth their tops with the back of a spoon. Bake the muffins for about 20 minutes. When a toothpick inserted into the middle of a muffin comes out clean and the muffins are golden brown, remove the muffins from oven and transfer them to cooling racks.